The black Garmin Quick Release Watch Band is compatible with the Forerunner 645, 645 Music, vivoactive 3, and vivomove HR series of smartwatches and activity trackers. With the simple slide of a bar, the quick release band can be attached quickly and easily. Replace a broken band or just change it for a new look. 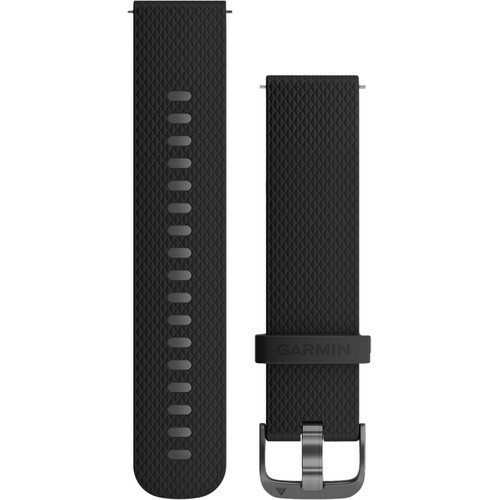 This silicone watch band features an adjustable buckle closure with slate hardware. It's 20mm wide and the adjustable strap can fit wrists that are 5-8.5" in circumference. Box Dimensions (LxWxH) 6.9 x 2.8 x 1.2"